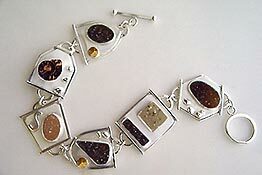 Six versions of example handcrafted jewelry drusy bracelets. 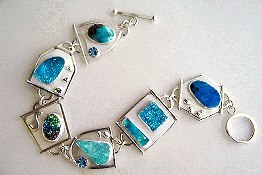 Four are black and natural shades and two are chrysocolla drusy with shades of aqua colored stones. stones on to an image of a previously made bracelet. Different gemstones, linking structure and/or clasps are available. topmost stone following the bracelet to the left, down and to the right. Please email or call if you are interested in having a custom made link bracelet designed.